top: similar // skirt: similar here and here // bag: similar // shoe: similar or exact // necklace: similar I was trying on this skirt when the doorbell unexpectedly rang so I was forced to throw on a top and call it an outfit when a few friends showed up. 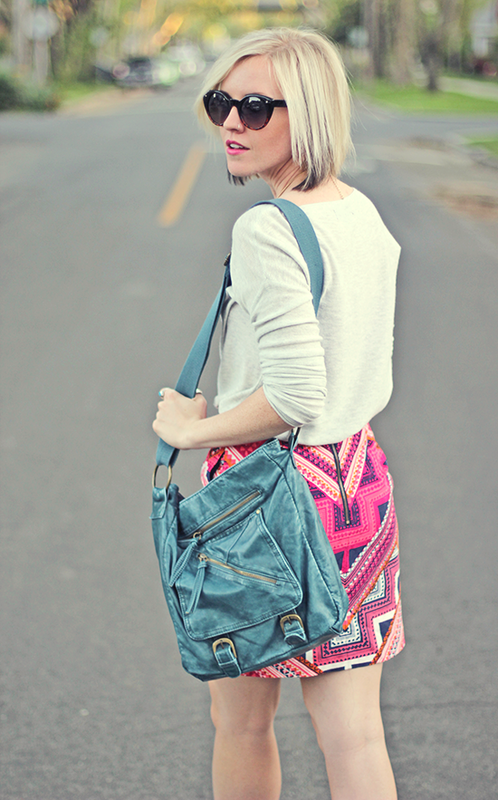 Maybe those are the best times to create an outfit because your brain makes quick decisions that sometimes just work. I realize more and more each day how important it is to trust your gut whether it be in business, friendship or well getting dressed haha. I know knee jerk reactions can be a bad thing but when it comes to creativity I say just go with it! 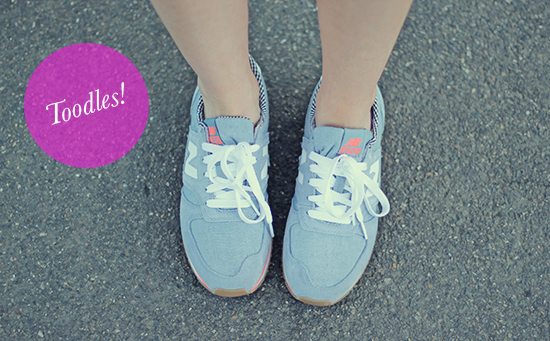 Ok so you caught me, these are my second pair of New Balance’s purchased since December. You may have seen the berry colored ones I’ve been sporting, here. I like this ice blue color they’re so appropriate for Spring. When I saw this skirt at Target I knew it would go well with the tennis shoes. I also knew this skirt be styled in a variety of ways. 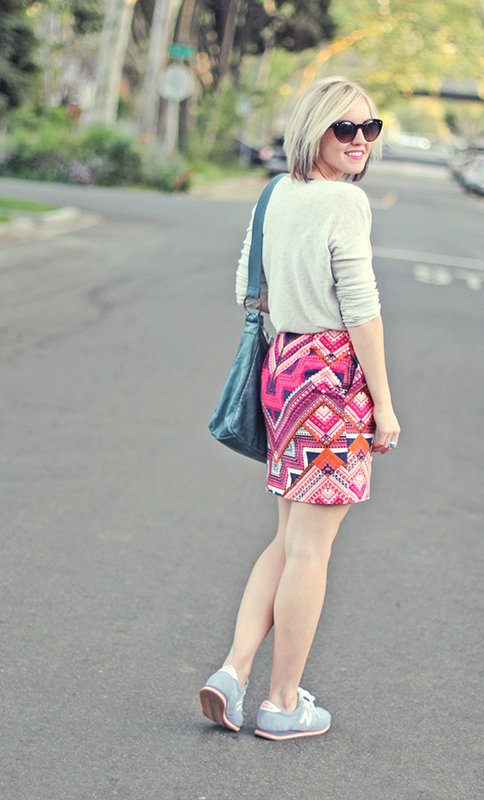 I’m thinking of doing like 10 ways to style a loud patterned skirt. Seriously my mind is going wild about it. Speaking of new blog post ideas, I noticed the post from last week, Wardrobe Storage Tour, did really well traffic wise. So I’m opening up the platform to you guys. What types of content would you like to see here on CMC? Do you have any burning questions for me to answer? So far I’ve heard ideas like “Work shoes that aren’t heels,” “How to organize your makeup,” “Sprucing Up a Business Look.” Feel free to add to the list—I’ve got my notepad ready! You look fantastic! Beautiful outfit, I love aztec print a lot, one of my favorite in fact, and I like how you styled it with the trainers, though looks quite unusual to me, as mostly I get to see balerinas or heels,but I guess that is your style vision and it looks great! 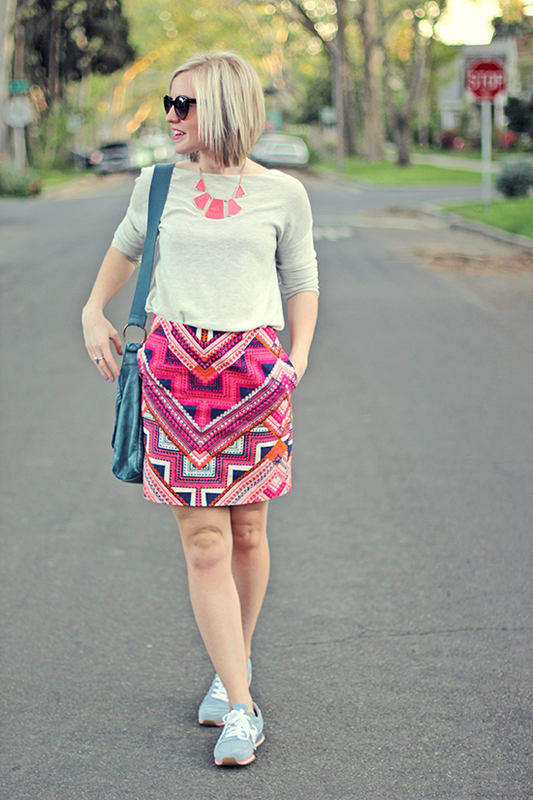 This skirt is so cute and I love how you paired sneakers with it! love this look ! comfy and chic. that skirt is gorgeous! your outfit posts are my fave. I could not believe when I read TARGET! What?! I can never bring myself to buy these types of skirts and then I kick myself later when I see them being styled! 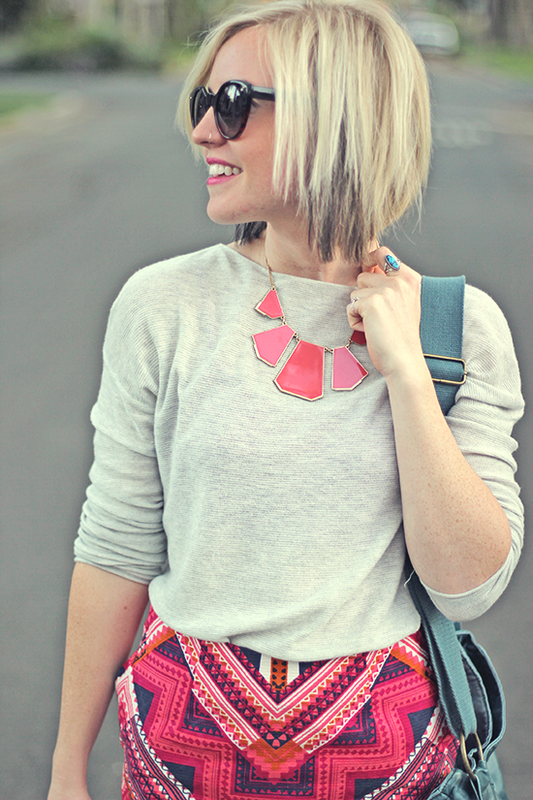 I am in love with this skirt, especially with the bright colour of the necklace. Too cute! 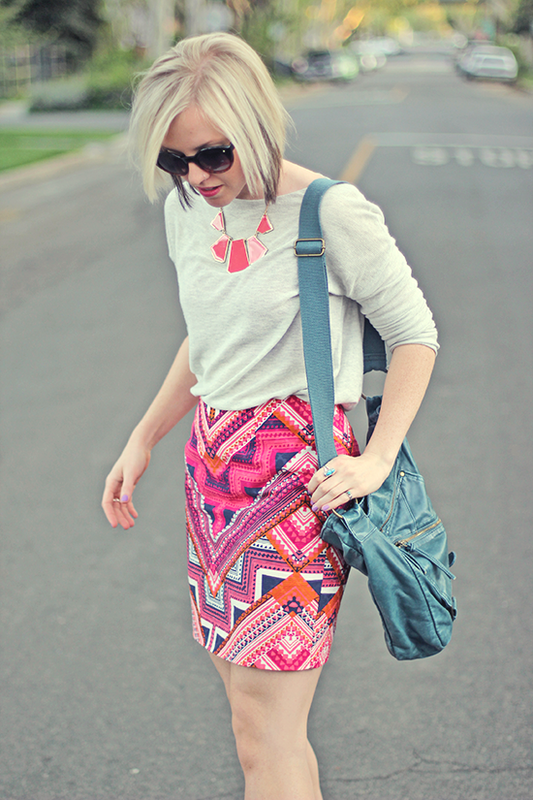 This skirt is amazing, love it, and your insta! That skirt was a great find! I love that you wore it with tennis shoes. I did the same thing recently with some high top Converse and really dug it. It can totally still be glam!